He is married with Valentina and has three children (Francesca, 7, Flavia, 5, and Antonio Filippo, 1). Carmine Di Noia, 41, is Deputy Director General and Head of Capital Markets and Listed Companies at Assonime (the Association of the Italian Corporations). He is member of the ESME (European Securities Market Expert Group) at the European Commission. He was member of other groups appointed by the European Commission: the Clearing and Settlement Advisory Monitoring Expert Group (CESAME) (2005-06); the Forum Group on Auditors Liability (2005-06); the Securities Expert Group on Financial Services Action Plan (2003-04). He was also member of the Consultative Working Group on Market Abuse of CESR (The Committee of European Securities Regulators). He is currently member of the Legal Committee of EALIC, the technical Committee on the Italian Capital Market Forum established by the Finance Ministry and board member of the XBRL Italian Association. He was member of the working group which drafted the new version of the Italian Corporate Governance Code. He was, until April 2001, the Head of the Market Information Office at Consob (the Italian Securities and Exchange Regulator). He joined Consob in 1995 at the Economics department. He received a Ph.D. in Economics at the University of Pennsylvania (USA) and a doctorate in Economic Theory at the University “Tor Vergata” of Roma, Italy. He has taught Microeconomics at the Dept. of Economics of the University of Pennsylvania and Monetary Economics at the LUISS-Guido Carli University in Rome. “General meeting related processes in Italy: the role of listed companies, intermediaries and central securities depositories in the light of some recent EU developments” (with M. Gargantini and S. Lo Giudice), Journal of Securities Operations and Custody, 2007. “Towards a New Architecture for Financial Market Regulation and Supervision in Europe" (with G. Di Giorgio), Journal of Financial Transformation, 2005. “Financial Market Regulation and supervision: how many peaks for the Euro Area” (with G. Di Giorgio), in Brooklyn Journal of International Law, 2003. “Customer-Controlled Firms: the Case of Financial Exchanges”, in Ferrarini, Hopt and Wymeersch (eds.) Capital markets in the Age of the Euro, Kluwer, 2002. “Which Deposit Insurance in the E-banking World?” (with G. Di Giorgio), in Revue Bancaire et Financiere, 2002. “Competition and Integration among Stock Exchanges in Europe: Netwok Effects, Implicit Mergers and Regulatory Considerations”, European Financial Management Journal, 2001. “Reshaping Financial Market Regulation and Supervision in Italy”, (with G. Di Giorgio and L. Piatti), in Rivista Italiana degli Economisti, 1, 2001. “Should Banking Supervision and Monetary Policy Tasks Be given to Different Agencies” (with G. Di Giorgio) International Finance, 2000. “Recent Developments in the Structure of Securities Markets (with A. Cybo-Ottone and M.Murgia), Brookings-Wharton Papers on Financial Services 2000. 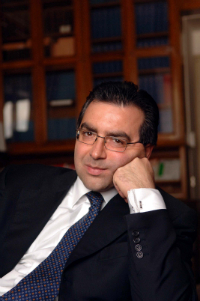 He has been the co-editor of three books: the Italian edition of “The Prudential Regulation of Banks” by Dewatripont and Tirole; the “Guide to the New Italian Financial Market Law”; “Intermediaries and Financial Markets”.